Background and Objective: c-Jun an activator protein-1 transcription factor component is activated by a variety of extracellular stimuli. Overexpression of c-Jun has been implicated in the pathogenesis of several types of cancer including oral cancer. The aim of this study was to correlate the expression of c-Jun in the normal buccal mucosa (NM), oral submucous fibrosis (OSMF), severe epithelial dysplasia (ED), and well-differentiated squamous cell carcinoma (WDSCC). Subjects and Methods: Qualitative and quantitative expression of c-Jun was evaluated in a total of 60 histopathologically diagnosed cases, 15 each of NM, OSMF, ED, and WDSCC. The percentage of positive cells (Nuclear labeling index [nLI]) was considered for quantitative assessment and grading of staining for qualitative assessment. Results: The average nLI of c-Jun expression in NM, OSMF, ED, and WDSCC was 35.02%, 35.61%, 89.09%, and 83.31%, respectively. A statistical significant difference was found in c-Jun expression quantitatively between NM and ED (P = 0.000), NM and WDSCC (P = 0.000), OSMF and ED (P = 0.000), OSMF and WDSCC (P = 0.000), and ED and WDSCC (P = 0.021). Qualitatively, statistical significant difference was seen in an intense c-Jun expression between OSMF and ED (P = 0.000), OSMF and WDSCC (P = 0.032), and ED and WDSCC (P = 0.011). Conclusion: The overexpression of c-Jun in ED and WDSCC reveals its role in early carcinogenesis as evidenced in this study. Therefore, c-Jun might act in different mechanisms and pathways which lead to a malignant transformation in oral lesions. Transcriptional factors are regulators of gene expression. Activator protein-1 (AP-1) is one of the first sequence-specific transcription factors, which collectively describes a group of structurally and functionally related members of the Jun, Fos, Fra-1, Fra-2, and some members of activating the transcription factor, and JDP subfamilies. c-Jun is the best-characterized AP-1 component. Human c-Jun is a 3.1 kb intronless proto-oncogene localized on chromosome region 1p31-32. It is expressed in many cell types at low levels, but its expression is upregulated by growth factors, cellular stresses, cytokines, and ultraviolet irradiation. Dysregulated activation and aberrant expression of c-Jun has been observed in several human malignancies., c-Jun is suggested as a factor in the malignant progression of oral lesions as well. The aim of this study was to correlate the expression of c-Jun in the normal buccal mucosa (NM), oral submucous fibrosis (OSMF), epithelial dysplasia (ED), and well-differentiated squamous cell carcinoma (WDSCC). Only well-differentiated squamous cell carcinomas (SCC's) were included and moderate and poorly differentiated SCC's were excluded from the study. Qualitative and quantitative assessment of c-Jun expression was retrospectively evaluated in a total of 60 cases with a site specification of buccal mucosa which included 15 each of NM, OSMF, ED, and WDSCC. Cases were retrieved from the department of oral and maxillofacial pathology, after obtaining the ethical clearance. The percentage of positive cells (nuclear labeling index [nLI]) was considered for quantitative assessment. Qualitative assessment was done by evaluating the grading of staining. The staining intensity was graded on a four-point scale as described: 0 – negative, 1 – mild staining, 2 – moderate staining, and 3 – intense staining. The parameters thus calculated were subjected to statistical analysis to correlate with the selected study groups. Nonparametric Mann–Whitney U-test was performed for quantitative assessment. Qualitative assessment was performed using Pearson's Chi-square test. Mann–Whitney U-test was performed between the study groups to see if any pair has a significant difference in the expression of c-Jun. The immunohistochemical procedure followed was based on the instructions provided by the manufacturer (Biogenex, USA). The presence of brown colored end product at the site of target antigen indicated positive staining. Two observers evaluated the staining, qualitatively and quantitatively. The counting was performed with a binocular light microscope under the high-power magnification (×40). The microscope was fitted with an eyepiece (×10) having an oculometer grid with 100 blocks (10 × 10) to count the cells proficiently and without bias. Representative fields were selected in each case. In each slide, up to 400 cells were counted in stepladder pattern to avoid recounting of the same areas irrespective of the number of fields. In each high-power field, the cells in each block of the grid were counted as a number of cells. A cell with nuclear staining without cytoplasmic staining was accounted for nuclear staining. The cells were counted and the percentage of their positivity was determined. c-Jun expression was evaluated on the basis of the presence or absence of nuclear staining. All the cases showed variable intensities of nuclear staining. Out of 15 NM, there was c-Jun nuclear expression in all the cell layers with the intense staining being seen in basal cell layer and superficial cell layer [Figure 1]. The staining intensity was mild (three cases), moderate (six cases), and intense (six cases). The nLI of c-Jun ranged from 14.88% to 84.80%, with an average percentage of 35.02%. The percentage of expression above 35% was considered as overexpression. Statistically significant difference was observed in c-Jun expression between NM and ED (P = 0.000), NM and WDSCC (P = 0.000), OSMF and ED (P = 0.000), OSMF and WDSCC (P = 0.000), and ED and WDSCC (P = 0.021) on quantitative assessment. No statistically significant difference was observed quantitatively between NM and OSMF (P = 1.000). The statistical significant difference was observed in an intense c-Jun expression between OSMF and ED (P = 0.000), OSMF and WDSCC (P = 0.032), and ED and WDSCC (P = 0.011) on a qualitative assessment. c-Jun overexpression in OSMF was seen in 8 cases and in 15 cases of ED and WDSCC, respectively. Among the 15 cases of OSMF, all the 15 cases showed nuclear positivity for c-Jun. Nuclear staining was a prominent feature in basal and parabasal layer [Figure 2]. The staining intensity was mild (4 cases) and moderate (11 cases). No cases showed intense staining. The average nLI of c-Jun was 35.61%. Among the 15 cases of ED, all the 15 cases showed nuclear positivity for c-Jun, with the intensity of staining increasing from basal cell layer to superficial cell layer. The well-differentiated cells in the superficial cell layer have exhibited intense staining when compared to the mild-to-moderate-staining which was seen in basal and parabasal cell layer [Figure 3]. The staining intensity was mild (1 cases), moderate (4 cases), and intense (10 cases). The average nuclear labeling index of c-Jun was 89.09%. Among the 15 cases of WDSCC, all the 15 cases showed nuclear positivity for c-Jun. The staining intensity was mild (1 cases), moderate (10 cases), and intense (4 cases). The epithelial tumor islands showed variable intensities of staining. 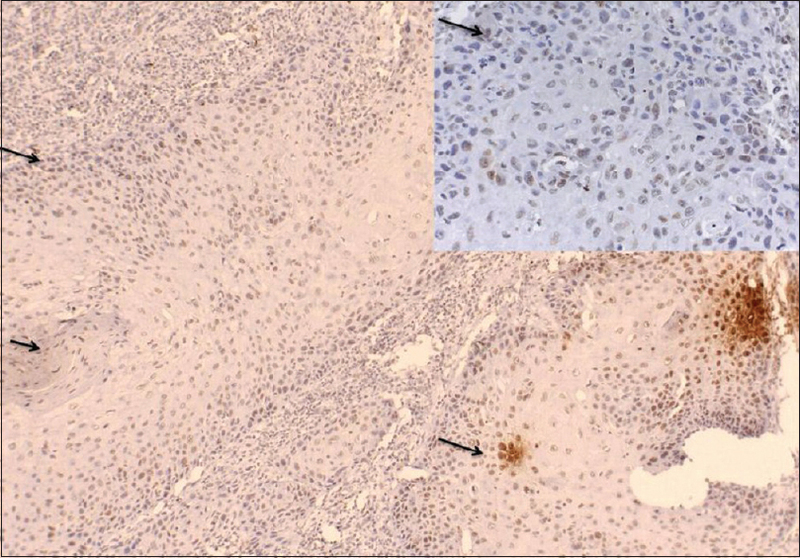 The peripheral cells of the tumor islands showed mild to negative staining and the central well-differentiated cells showed intense staining [Figure 4]. The average nLI of c-Jun expression was 83.31%. In this study, all the parameters were individually calculated and were correlated with the various study samples selected. The NM studied helped us to arrive at a cutoff value for c-Jun negative expression and overexpression. The values thus obtained from immunohistochemical analysis were used to deduce nLI. This percentage was obtained from the mean of the percentage of c-Jun expression of the 15 cases of NM studied. The average of the nLI was considered as a cutoff value. The cutoff value thus obtained was 35%. Thus, obtained value decides the negative and overexpression in the rest of the study sample. The cutoff value obtained in our study was slightly higher when compared to the cutoff value from the literature, wherein it was 10%, and NM showed cytoplasmic expression. Only nuclear positivity was considered as a positive expression in our study. The average nLI of c-Jun expression in NM, OSMF, ED, and WDSCC was 35.02%, 35.61%, 89.09%, and 83.31%, respectively. In our study, the c-Jun expression in the NM was completely nuclear unlike other studies wherein, the expression was completely cytoplasmic. Nuclear expression of c-Jun in our study could be due to the exposure of cells to any physiological and pathological extracellular stimuli, which has led to the immediate early gene (IEG) expression. In the cells exposed to any of the physiological or pathological extracellular stimuli, the genes which respond to these stimuli are IEGs. AP-1 members are protein products of Jun and fos genes of IEGs family. It was found that OSMF showed almost a similar expression as NM in our study, and is in accordance with the previous studies. One of the proven etiologies for OSMF is areca nut. On areca nut chewing, oral mucosal cells are continuously stimulated by ANE (areca nut extract) and arecoline, the persistent induction of the c-Jun proto-oncogene by these may be one of the mechanisms responsible for c-Jun expression in OSMF. In the cases of ED that were studied, all the cases showed overexpression of c-Jun. Nuclear expression in ED could be interpreted as an early mechanism of cell-cycle disturbance since other authors have shown that the expression of c-Jun increases early in carcinogenesis. c-Jun is required for the progression of cells through the G1 phase of the cell cycle by direct transcriptional control of the cyclin D1 gene, which provides a molecular link between the growth factor signaling and changes in the cell-cycle proteins that regulate G1 progression. 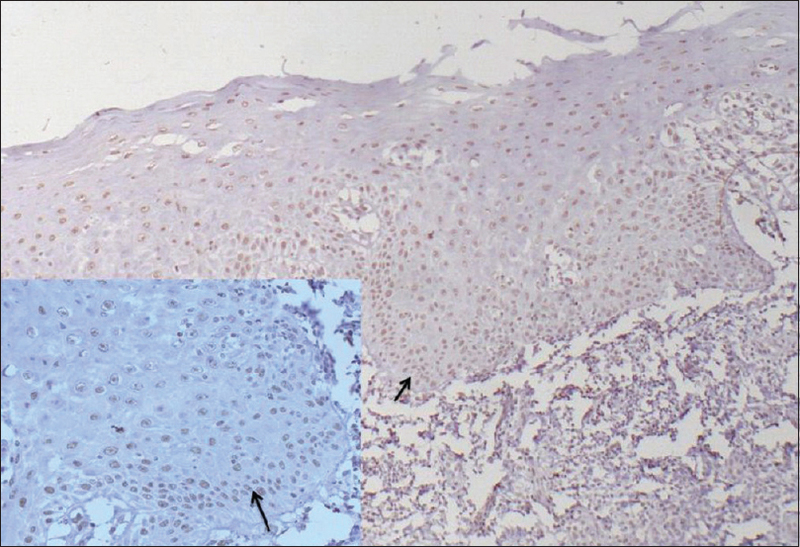 A study on the comparison of immunohistochemical expression of c-Jun, c-Fos, and cyclin D1 in oral premalignant and malignant lesions was done. Cyclin D1 expression was consistently increased in OSCC and also in few cases of moderate-to-severe dysplasia. It is noteworthy that many genes encoding components of the cell cycle have an AP-1 binding site in their promoters. Cyclin D1 is an example of one of these genes that may directly link AP-1 to cell-cycle progression since it is related to G1 progression. However, it is known that overexpression of cyclin D1 shortens the G1 phase of the cell cycle and that c-Jun as part of the AP-1 transcription complex is an important regulator of G1 transition of the cell cycle. It was hence assumed, that damage occurring in some of these proteins could have influenced the function of other genes involved in the cell cycle. The higher expression of c-Jun can also be attributed to the frequency, duration, and the form of tobacco used and as an effect of tobacco which is genotoxic. All the cases, in this study group, were tobacco users of smokeless form for at least 6 years duration and above. It is a known fact that South Indian population shows more association with smokeless form of tobacco. It was found that all the cases of WDSCC have showed c-Jun overexpression in our study. The results in our study were in accordance with the previous studies. c-Jun is likely to play a role in oral carcinogenesis. c-Jun and other components of AP-1 regulate transcription of target genes and have increased activity when oncogenic activation of several signal transduction pathways occur. During carcinogenesis, the expression of c-Jun was shown to increase early, when the cells were stimulated to enter the cell cycle. Recent studies have shown that loss of cell–cell contacts, using cell separation or functional inhibition of the adhesion molecules E-cadherin caused a marked and sustained increase in c-Jun protein accumulation and that this increase is not transcriptionally, but rather translationally controlled. Considering tumor promotion and progression are often accompanied by the loss of adhesion molecules, c-Jun accumulation in WDSCC tumor cells could also have been due to translational activation. The present findings indicate that c-Jun; the major component of the AP-1 transcription factor is altered in dysplastic epithelium and in oral SCC. The overexpression of c-Jun in ED and WDSCC reveals its role in early carcinogenesis as evidenced in our study. Hence, c-Jun might act in different mechanisms and pathways that lead to a malignant transformation in oral lesions. Hess J, Angel P, Schorpp-Kistner M. AP-1 subunits: Quarrel and harmony among siblings. J Cell Sci 2004;117:5965-73. Haluska FG, Huebner K, Isobe M, Nishimura T, Croce CM, Vogt PK, et al. Localization of the human JUN protooncogene to chromosome region 1p31-32. Proc Natl Acad Sci U S A 1988;85:2215-8. Wisdom R, Johnson RS, Moore C. C-Jun regulates cell cycle progression and apoptosis by distinct mechanisms. EMBO J 1999;18:188-97. Wang H, Birkenbach M, Hart J. Expression of Jun family members in human colorectal adenocarcinoma. Carcinogenesis 2000;21:1313-7. Mishra A, Bharti AC, Saluja D, Das BC. Transactivation and expression patterns of Jun and Fos/AP-1 super-family proteins in human oral cancer. Int J Cancer 2010;126:819-29. Kuo R, Lin C, Kuo MY. 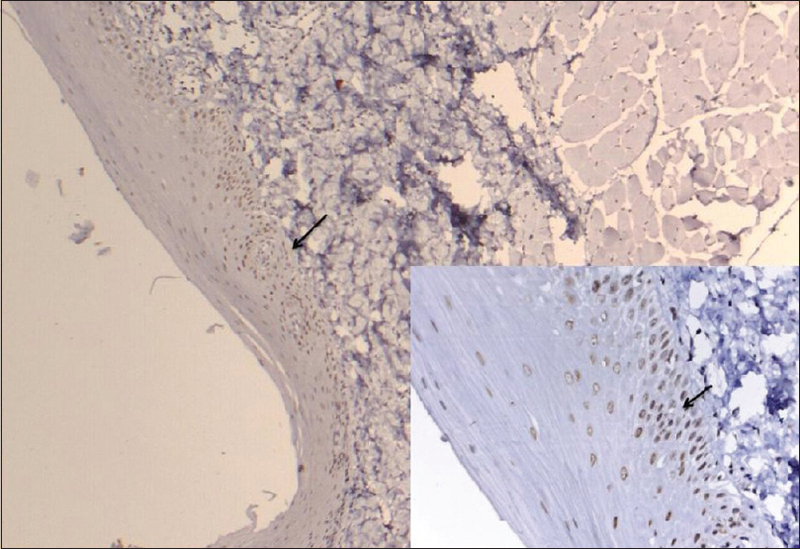 Prognostic role of C-Jun activation in patients with areca quid chewing – Related oral squamous cell carcinoma in Taiwan. J Formos Med Assoc 2006;105:229-34. Turatti E, da Costa Neves A, de Magalhães MH, de Sousa SO. Assessment of c-Jun, c-Fos and cyclin D1 in premalignant and malignant oral lesions. J Oral Sci 2005;47:71-6. Mehic D, Bakiri L, Ghannadan M, Wagner EF, Tschachler E. Fos and Jun proteins are specifically expressed during differentiation of human keratinocytes. J Invest Dermatol 2005;124:212-20. Bazarsad S, Zhang X, Kim KY, Illeperuma R, Jayasinghe RD, Tilakaratne WM, et al. Identification of a combined biomarker for malignant transformation in oral submucous fibrosis. J Oral Pathol Med 2017;46:431-8. Jeng JH, Chang MC, Hahn LJ. Role of areca nut in betel quid-associated chemical carcinogenesis: Current awareness and future perspectives. 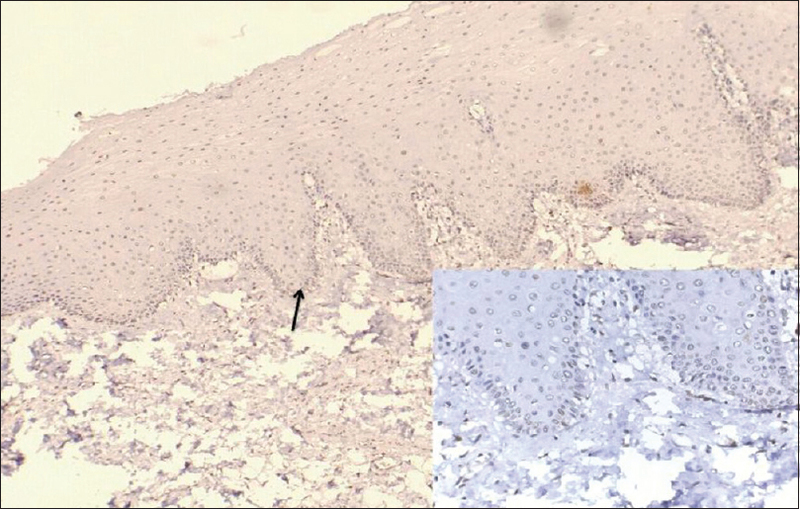 Oral Oncol 2001;37:477-92.
de Sousa SO, Mesquita RA, Pinto DS Jr., Gutkind S. Immunolocalization of c-Fos and c-Jun in human oral mucosa and in oral squamous cell carcinoma. J Oral Pathol Med 2002;31:78-81. Stein B, Rahmsdorf HJ, Steffen A, Litfin M, Herrlich P. UV-induced DNA damage is an intermediate step in UV-induced expression of human immunodeficiency virus type 1, collagenase, c-Fos, and metallothionein. Mol Cell Biol 1989;9:5169-81. Chen SY, Cai C, Fisher CJ, Zheng Z, Omwancha J, Hsieh CL, et al. C-Jun enhancement of androgen receptor transactivation is associated with prostate cancer cell proliferation. Oncogene 2006;25:7212-23. Vleugel MM, Greijer AE, Bos R, van der Wall E, van Diest PJ. C-Jun activation is associated with proliferation and angiogenesis in invasive breast cancer. Hum Pathol 2006;37:668-74. Lallemand D, Ham J, Garbay S, Bakiri L, Traincard F, Jeannequin O, et al. Stress-activated protein kinases are negatively regulated by cell density. EMBO J 1998;17:5615-26.